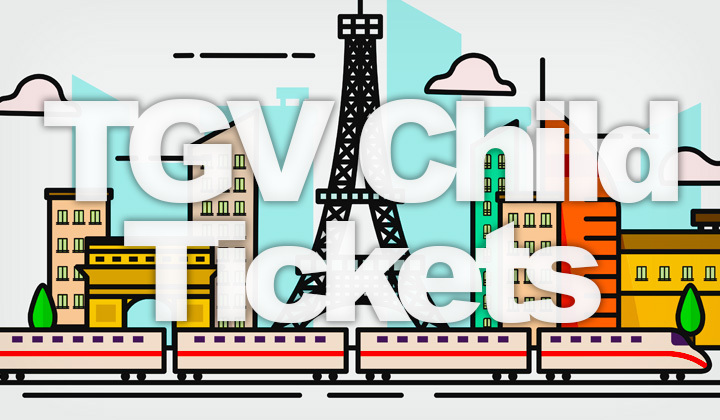 Best TGV Child Tickets Price: Cheap Kids Seat for a Few Euro Fare! Traveling on TGV trains with children in France is fun and convenient, as well as affordable — here’s how to get the incredibly low child fare ticket price! 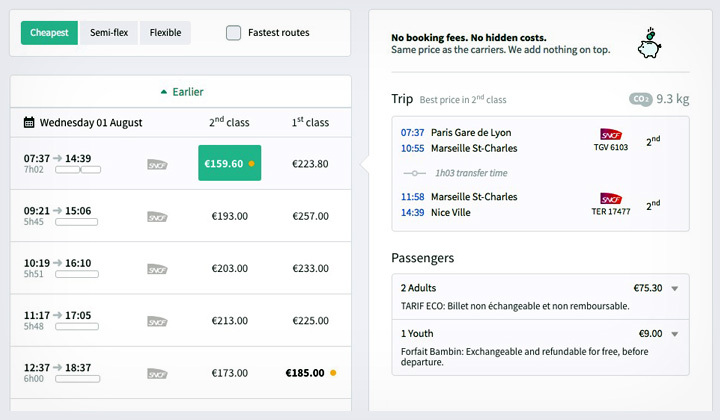 I was recently traveling from Paris to Nice with the family, and tried a handful of booking sites in English looking for the best ticket price. To my surprise I found out that my youngest children could travel with their own seat, just 9 euros each for a 1000km trip! Or even less for shorter distances. And booked early, also adult and youth tickets were affordable. Being tired of air-travel, I was delighted that travel was cheaper by high speed trains in France! The special child fare is only available on the “Trainline” ticket retailer. Here’s how to grab your cheap TGV seats for your kids! 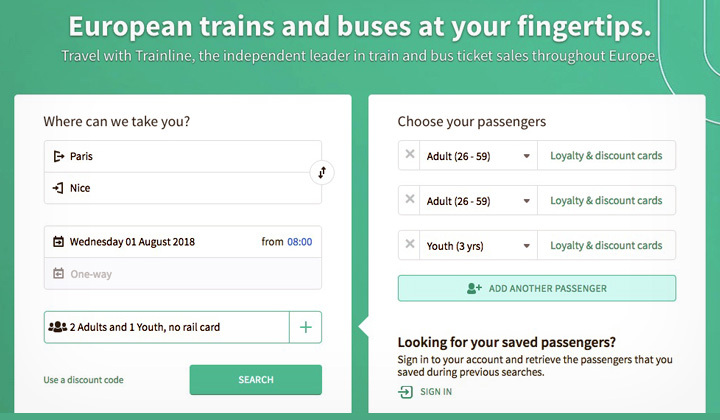 Navigate to Trainline, and make sure you are on the EU version of the website. You are immediately presented with a search for trains throughout Europe. Enter origin, destination, date and all passengers with their age. The form will automatically search for the cheapest possible tickets for both 2nd & 1st class. You will be presented with a list of all TGV trains running on that date, and the total price with taxes and all other charges included. Choose between tickets from Cheapest, to Semi-flex and Flexible. Or sort search results with the fastest train routes only, without changes if possible. Also, you can select if you need booth seating (highly recommended for families), or first floor or second floor with better views (latter up to preference). Note the “Passengers” section to see which tickets you are valid for. If you see “Fortfait Bambin”, congratulations. It’s the cheapest TGV seat fare possible! Children and babies, under 4 years old who do not require a seat can travel free on all TGV trains in France. If they require a seat, you are valid for the “Bambin” or toddler ticket price, which is a formal payment of a few euros. On top, the ticket is valid for a refund if canceled before the train departs, or can be changed to another date without any additional cost. Children under 12 years old are valid for the “Enfant” or child fare. The cost of these tickets is usually half price from the regular adult fare. Please note, price also varies depending on the TGV train and booked date. Thumb rule is, the earlier you book the cheaper. The price is the same as booked directly with carrier, Trainline doesn’t add anything to the ticket fare. Good luck finding the best fares for your family! Any questions about train and TGV travel in France? Or what’s your experience with child tickets, give us a comment! Finally, not all but some of the articles I wrote on my blog contain links that are affiliated with companies that they link to. This is to support the blog and won’t affect the price of any such services. Much thanks for your voluntary support. And for having a read! Hope this was helpful. David.